There is NOTHING simple about FPIES. It is difficult to diagnose, difficult to understand, difficult to manage, difficult to explain, and very difficult to live with. When your child has FPIES everything becomes more complicated. Having dinner at a relative’s house means preparing a meal (as well as snacks and dessert) that travels well that you are pretty sure your toddler will eat with minimal intervention from you. It means spending a holiday running interference between your child and the appetizers. It means stressing about finding a shampoo that won’t be harmful. It means spending who-knows-how-long on hold waiting for a customer service representative to confirm that “natural and artificial flavors” aren’t code words for allergens. It means always being on the lookout for other toddlers who might try to share their goldfish crackers with your son. It means being on trash patrol wherever you go so that your curious child doesn’t pick up (and God-forbid put in his mouth) a discarded candy wrapper or dropped Cheerio. It means avoiding untested foods and going through crazy food trials before you can comfortably feed something to your child. I could keep going, but you get the picture. FPIES turns your world upside-down and adds a couple of extra layers of work to the easy, walk in the park that is raising a toddler. But we rise to the challenge. We are ready. We are super-parents, ready to don our capes and do whatever it takes to keep our children safe and their lives as normal as possible. That being said, sometimes we get ahead of ourselves. Sometimes we are so prepared for the extra layers of difficulty that we factor them in when it isn’t necessary. We anticipate unlikely problems or create improbable scenarios. Sometimes the crazy takes over and we make things more difficult then they have to be. I’m often grateful that my husband, who is incredibly involved in E’s care and supportive of all that I do, is removed from E’s minute to minute care just enough to be objective. It is his job to tell me when I’m being crazy. He’s the one that reminds me that we aren’t leaving the planet for a dinner party and that our hosts will probably have a refrigerator to store E’s safe food. He’s the one who reminds me that E already has a safe chocolate and convinces me to turn that into Easter candy. He’s the one who reminds me that while a short nap is annoying, it is not the sign of an impending reaction. He’s my crazy-meter and is usually pretty good at sounding a warning bell when I’m approaching a full-on crazy attack. By the way, he’s also the one that reminds me that I have more resources than I realize, that I am capable of supermom status, and that I can handle all of the challenges that FPIES brings. Unfortunately we recently had a situation where my crazy-alarm malfunctioned. I think it started when my husband was forced to spend a day in my cape. Right after Christmas E was recovering from an ear-infection and had to see his pediatrician on the same day that we had previously scheduled a dietician appointment. It was incredibly bad timing that I woke up that morning with an awful stomach bug, the kind that prevents you from leaving the bathroom, let alone the house. Jonathan was on his own. He seemed to take it all in stride but I know how stressful one doctor appointment can be, let alone two in the same day. The dietician was especially challenging because I am generally in charge of preparing E’s foods and it’s hard to have a useful adult conversation while a toddler explores a new office. One of Jonathan’s take-aways from the dietician appointment was that E needed more calcium in his diet and that we could accomplish this by feeding him salmon-potato patties made with canned salmon. It took us a couple of months to get around to the salmon trial but when we did, super-dad was in charge of making the salmon into patties to feed our son. Jonathan woke up one Saturday morning and reported to the kitchen where he started grinding chia seed, flaking salmon, chopping garlic, and who knows what else. It wasn’t a difficult recipe but it was somewhat time-consuming and in the end E was not a fan. I used every supermom power I could think of to get him to eat. We were way past generic airplanes of food flying into the hangar. I was acting out scenes from Dinosaur Train and Curious George (and a little bit wishing that we allowed him to watch more TV so I had a larger repertoire). I was singing, dancing, using bad accents, and generally making a fool of myself. It was exhausting and my audience was not appreciative. I had even resorted to bribing E with other foods. If he took a bite of the salmon patty, he was rewarded with a bite of avocado (I don’t know where this kid came from but he’d take avocado over chocolate any day!). After a couple of days of forcing my son to eat food so that I would know it was safe (but never feed it to him again) I was ready to give up on salmon all together. But it was still important to me to know that a fish was safe. This would open the door to other fish and answer a question that the allergist was sure to ask at our next appointment. So we went back to the drawing board and decided to change our approach. While the canned salmon was best for calcium intake (because it contains skin and bones – yuck), maybe it was as unappetizing to E as it was to me and we should just try another recipe. I bought a frozen salmon filet and Jonathan consulted with some friends to develop a lovely, safe poached salmon recipe. So he spent another Saturday morning stinking up our house lovingly creating a gourmet meal for our toddler. Luckily our son is generally open to trying new food and readily ate about two bites before he decided he was finished. Checking out the poached salmon. Maybe he really hated salmon, or maybe he decided he liked his new mealtime entertainment. Either way, I was not interested in another week of theatrics and fighting with him to eat a food that wasn’t going to become a regular menu option. I was just about ready to give up on the salmon all together when I remembered the KISS principle. 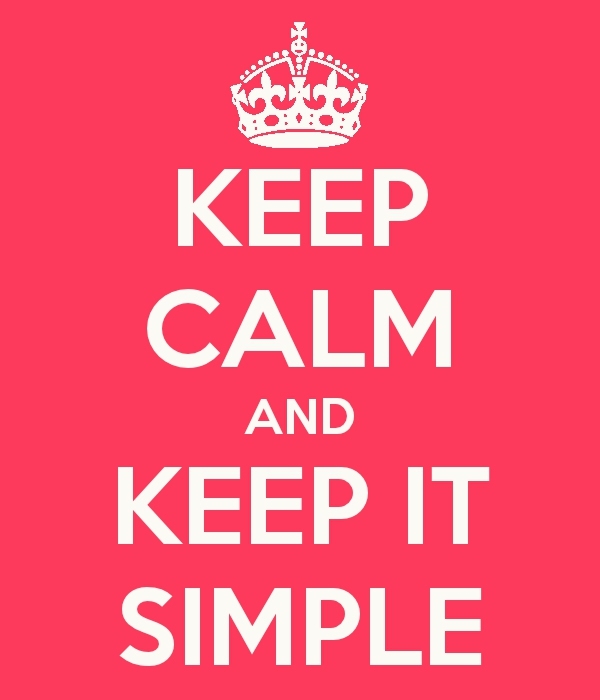 KISS stands for Keep It Simple, Stupid. It’s a reminder to stick with the basics and not make things more complicated than they have to be. Hmm. 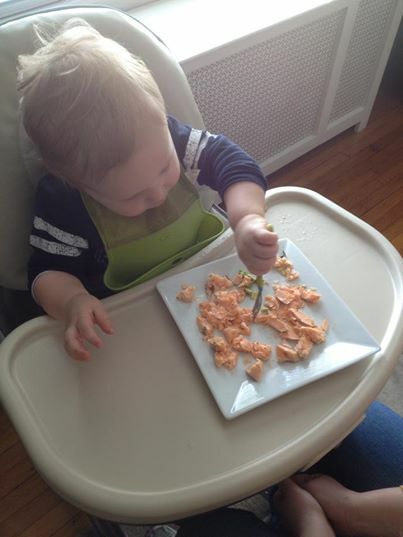 Were salmon patties and poached salmon for a one year old unnecessary complexities? I’m not sure why I didn’t see it sooner. Typically I try to conduct food trials with the purest form of the food possible – keep it simple. I decided to harness the power of the avocado and simply mixed the canned salmon with avocado, mashing them together like a salad. Magically, he ate it! More accurately – he shoveled the salad into his mouth as though at any minutes I might take it away from him! I couldn’t believe it! The rest of the salmon trial was a pleasure. Most importantly there were no reactions! All this was to say that salmon was a pass! And now I have a SIMPLE new recipe that I can use to increase E’s protein and calcium intake. 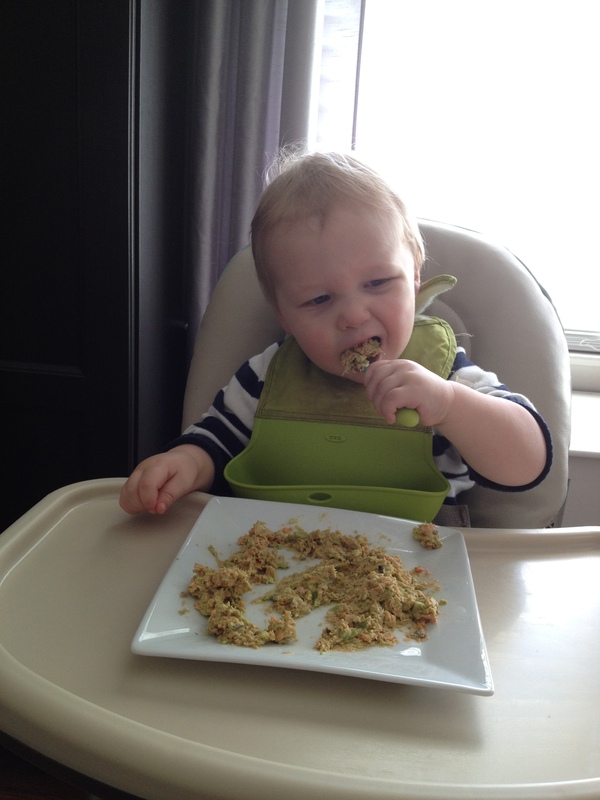 Shoveling the Salmon/Avocado Salad into his face.